Vatican City, also called the Holy See, is a tiny sovereign independent state. Vatican City is only .44 sq. km. and has a population of less than 1000. Vatican City gained independence from Italy on 11 February 1929. In 2013, over 5 million people visited Vatican City. The Holy See is the seat of the Catholic religion and home of the Pope since 1378. The pope lives in the papal apartments in the Vatican and the church of the Pope, St.
Peter's Basilica, is in Vatican City. Vatican City is surrounded by Rome. Visitors enter Vatican City through St. Peter's Square. The best way to walk to Vatican City from historic Rome is over the Ponte St. Angelo bridge. Across the bridge, one arrives at Castel St. Angelo, just outside Vatican City. Castel St. Angelo has a connecting passage to the Vatican once used by fleeing popes. If you plan to spend much time visiting the attractions in Vatican City, it might be convenient to stay in a hotel or bed and breakfast near the Vatican. Here are Top Places to Stay in Vatican City. The Vatican Museums is the largest museum complex in the world with over 1400 rooms. The Vatican Museums Complex includes the museum, galleries with 3,000 years of art, the Sistine Chapel, and parts of the papal palace. There is an astonishing amount of art, including a room of works by Raphael. The Pinacoteca Vaticana is probably Rome's best picture gallery with many Renaissance works. One of the most impressive halls is the Hall of Maps, with murals of old maps of the papal lands. At the Vatican Museums, you choose from 4 different itineraries all ending with the Sistine Chapel. Because of the vastness of the museum, it's wise to take a Vatican Museums guided tour. Visitors with guided tour reservations or who book tickets in advance enter without waiting in line. The museums are closed Sundays and holidays except for the last Sunday of the month when they're free. Here is Vatican Museums Visiting and Ticket Booking Information. Select Italy also sells Skip the Line Vatican Museums Tickets that you can buy online in US dollars. The Sistine Chapel was built from 1473-1481 as both the pope's private chapel and the venue for the election of the new pope by the cardinals. Michelangelo painted the famous ceiling frescoes, with the central scenes depicting creation and the story of Noah, and decorated the altar wall. Biblical scenes on the walls were created by several famous artists, including Perugino and Botticelli. See Sistine Chapel Visiting Information, Art, and History. Saint Peter's Basilica, built on the site of a church covering Peter's tomb, is one of the largest churches in the world. Entrance to the church is free but visitors must be properly dressed, with no bare knees or shoulders. 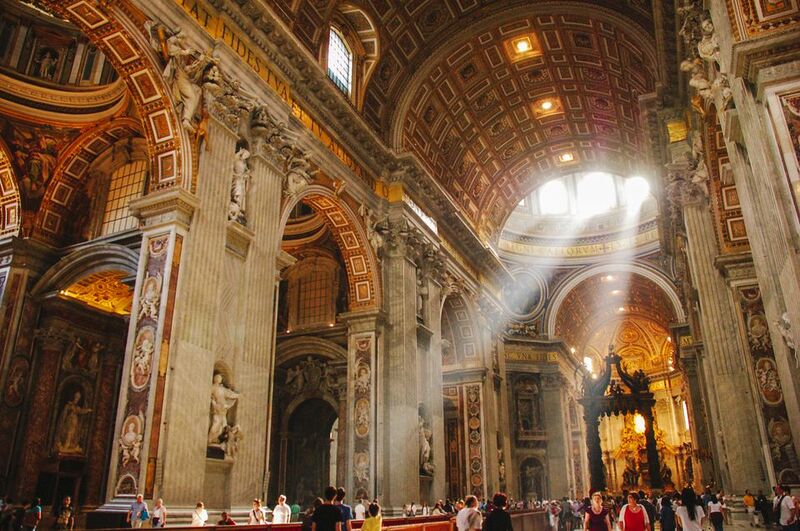 Saint Peter's Basilica is open daily, 7 a.m. - 7 p.m. (until 6 PM October - March). Masses, in Italian, are held all day on Sundays. Saint Peter's Basilica sits on Saint Peter's Square, a top religious and tourist destination. Many important art works, including Michelangelo's famous Pieta, are in the church. You can also visit the Pope's tombs. Vatican City Tourist Information is on the left side of St. Peter's Square and has lots of good information and a small shop selling maps, guides, souvenirs, and jewelry. Tourist information is open Monday-Saturday, 8:30-6:30. The closest Metro stop to the museum entrance is Cipro-Musei Vaticani near Piazza Santa Maria delle Grazie, where there is also a parking garage. Bus 49 stops near the entrance and tram 19 also stop nearby. A number of buses go close to Vatican City (see links below). The Swiss Guard have guarded Vatican City since 1506. Today they still dress in the traditional Swiss Guard costume. Guard recruits must be Roman Catholic Swiss nationals, between 19 and 30 years of age, single, high school graduates and at least 174cm tall. They must have also completed Swiss military service. The Pope: The Pope holds Wednesday General Audiences with the Holy Father at 10:30 but you must have a ticket (which is free) to attend. See how to request tickets for a Papal Audience or you can reserve tickets for the Papal Audience for a booking fee and transportation from your hotel through Select Italy. On Sundays at noon, the Pope usually delivers a blessing from his window for people gathered in St. Peter's Square. The Pope also presides over special services and masses, some of which also require a ticket. Underground Vatican: You can visit the Tomb of St. Peter and the Vatican excavations on a guided visit by reservation only. St. Peter's Dome: St. Peter's spectacular dome can be visited for a fee, 8AM-5:45 (4:45, October-March). Entrance is from the right side of the Basilica's porch. Guided Tours: Although I'm not a big fan of guided tours, I was very happy to have one at the Vatican. The Vatican Museum is huge and crowded so having someone knowledgeable to direct me and tell me interesting information about the Museum and its displays, the Sistine Chapel, and Saint Peter's Basilica was very useful and made my visit more enjoyable. I took a tour with Miles&Miles. Select Italy offers a Raphael and Michelangelo Tour that includes the Museums, Sistine Chapel, and Raphael Rooms of Pope Julius II. The best way to see the Museums and Sistine Chapel without the huge crowds is to take a Before or After Hours Guided Tour.